You haven't experienced state-of-the-art compact lifting convenience until you've used the BendPak SP-7X. This 7,000-lb. capable lift comes loaded with an extendible, pull-out top lift platform, equalization torsion bar, hardened pivot pins, dual hydraulic cylinders and ergonomic controls. Let the SP-7XLF take those vehicles, and your bottom line, to new heights. BendPak LR-4A optional arm kit available. This flush-mount version of our full-rise scissor lift is ideal for shops that are limited in space but have a huge demand for performance. This lift has all the lifting height of a two-post lift without the columns that take up precious shop space. Features a 21.5” x 63” lift platform, equalization torsion bar, hardened pivot pins, dual hydraulic cylinders and ergonomic controls. The SP-7XLF is the flush-mount version of our full-rise scissor lift. If your garage has a recessed area of concrete designed to hold flush-mount lifts, you’ll be pleased by how “invisible” this lift is in your garage. When it’s collapsed, you’re free to drive over it and work around it without tripping on wires or cables. 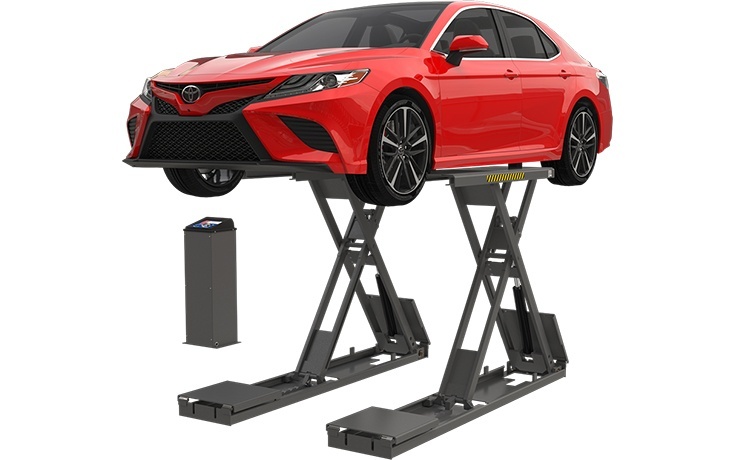 We’re proud that the collapsed SP-7XF is extremely low-profile, but if you want to take low to virtually zero, the flush-mount version of this model is the perfect car lift solution for your garage. With 68" inches of lifting height and an open center, many mechanics have comfortable standing room to perform oil changes, transmission drops and an infinite number of other undercarriage services. The heavy-duty boxed-steel formed base frame increases stability and reduces stress on the overall structure. The elongated base provides a solid foundation for a smoother, perfectly level rise. An electric hydraulic power system is kept in a rugged console box off to the side of the lift, safe from the lifting/lowering of the frames in and out of your flooring. The controls are easy to reach and allow you to keep an eye on your surroundings while lifting and lowering heavy vehicles. In order to push the frames out from a flush-mount position quickly and powerfully, the SP-7XF is fitted with two hydraulic cylinders with flow restrictors to ensure an even lift. The controlled flow is sophisticated enough to prevent the risk of tipping, even if one cylinder loses pressure (due to an unlikely rupture or pinch, for instance). 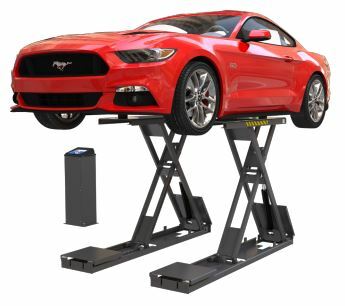 No emergency will result in the up-ending of your vehicle—the car lift would simply descend to the ground evenly on both frames. A single convenient operator stand allows you to release the pneumatic safety locks from a safe distance without ever worrying about manually lifting release arms or latches. The locks disengage when the lift lowers and automatically, and multiple locking positions provide operators with more service options. The locks engage or disengage at each position seamlessly with the movement of the scissor lift frames. Zerk grease fittings are self-lubricating and long-lasting, ensuring a smooth rise and descent of the lift platforms at all times. Hard rubber blocks set right atop the rubber padding on the lift platforms, safely and securely engaging vehicle pinch rails and OEM frame lift points. An easy-to-read owner's manual offers complete installation instructions and maintenance tips, as well as safety/caution decals that come standard with every lift purchase. Click the button below to add the BendPak SP-7XLF Scissors Frame Engaging Lift - Flush Mount to your wish list.